The United States has made public a trove of documents that intelligence officials say were taken by Navy SEALs during the raid on Osama Bin Laden’s compound that show the late terrorist’s interest in France, economics and conspiracy theories. 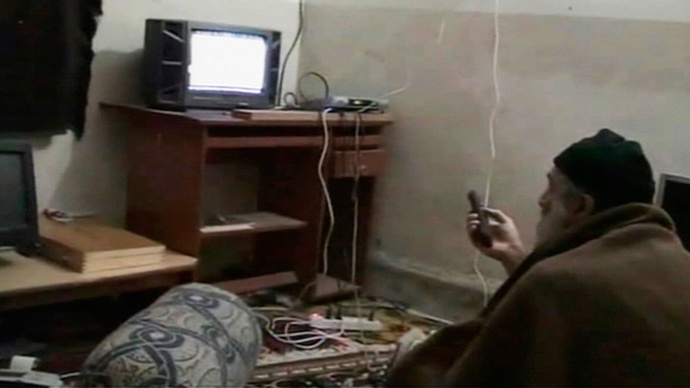 On Wednesday, the Office of the Director of National Intelligence released a list of English-language material recovered during the infamous raid in Abbottabad, Pakistan in 2011, when Bin Laden was killed. The ODNI also made public contents of more than 100 personal documents that were said to have belonged to the Al-Qaeda leader, including letters to family members and allies. Among items the intelligence community say was inside the compound are at least 75 publicly available US government reports discovered at Bin Laden’s home and digital e-books, computer manuals, religious documents and think tank studies. A letter to one of Bin Laden’s wives also includeshis will, where he advises her on the marriage of his daughters and the future of his son. "My will: If I get killed, and you want to return to your family, then that is okay, but you have to raise my children properly, and to watch them, and be careful of bad company for them, especially after puberty, especially the girls," the letter reads. "So be very careful about them and if you can marry them to mujahidin, then that is best, or else to good people. As for `Usama, when he reaches adulthood, if there is someone else who cares for you, then send him to the battlefield at his grandfather's. I specify his grandfather because his path is clear and true without qualms on it, and because jihad is an obligated duty for all adults, so he has to conduct jihad." Among the books that intelligence officials say belonged to Bin Laden are Obama's Wars, Pulitzer Prize-winner Bob Woodward’s account of the current administration’s roles in overseas conflicts, and two works by American academic Noam Chomsky. There was also a copy of the US government’s report on the September 11, 2001 terrorist attacks attributed to Bin Laden and reports on Iraq, Afghanistan and Al-Qaeda, among others. There were also more than a dozen items related to France or the French economy, including factsheets and a list of French shipping companies, and books on the illuminati and 9/11 conspiracy theories, such as Bloodlines of the Illuminati and The New Pearl Harbor: Disturbing Questions About the Bush Administration and 9/11. “It is in the interest of the American public for citizens, academics, journalists and historians to have the opportunity to read and understand Bin Laden’s documents,” US House of Representatives intelligence committee Chairman Devin Nunes (R-California) said in a statement to The Guardian. Jeff Anchukaitis, a spokesman for the DNI, explained that the release constitutes “a sizeable tranche of documents recovered during the raid” and was in keeping with President Barack Obama’s call for “increased transparency,” according to AFP. According to the agency, all documents that can be published without harming ongoing operations against Al-Qaeda or other terror groups will be released pending further review. “Given the large number of documents to review, and the increasing public demand to review those documents, this winter the White House asked CIA to declassify and the ODNI to release documents as they were ready,” Anchukaitis said. Wednesday’s dump comes after award winning journalist Seymour Hersh published a lengthy essay calling into question the US government’s official narrative concerning the Bin Laden raid. In an interview with RT America earlier this month, Hersh took aim at the White House’s claims that “treasure troves of documents” had been taken from the compound. “Where? Who? What? We haven’t seen much of that,” Hersh said at the time. According to CIA spokesman Ryan Trapani, however, the decision to release the documents so soon after is purely coincidental, AFP reported.